TLP-IASbaba - Day 66 – Q 2. In the light of recent conflicts between locals and migrants in almost all the states, do you think that the concept of ‘Permanent Residents’ should be extended to other states as well to protect the interests of locals? Day 66 – Q 2. In the light of recent conflicts between locals and migrants in almost all the states, do you think that the concept of ‘Permanent Residents’ should be extended to other states as well to protect the interests of locals? 2. In the light of recent conflicts between locals and migrants in almost all the states, do you think that the concept of ‘Permanent Residents’ should be extended to other states as well to protect the interests of locals? The concept of ‘Permanent Residents’ has been defined in Indian constitution, under article 35A for Jammu and Kashmir. It grants special privileges to the local population and restricts migrants from enjoying certain rights. Reduced conflicts- A defined set of rights for locals and migrants reduces conflicts between them. Employment- Ensures local populace is employed first, thus preventing their out migration and distress. Protection of culture- Preserves unique culture of a region by reducing the influx of outsiders. Voting- Only locals will be able to vote, giving them more power to decide the interests of their region. Against spirit of oneness- It creates class within classes of Indian citizens and gives rise to regionalism. Rise to alienation and separatist identity- Like in case of J&K, it has resulted in alienation among its people. Against the spirit of Constitution- It violates fundamental rights, like those under article 19. Stifle regional growth- Migrants in most cases help in spurring the growth of the region through investment or cheap labor. Gender discrimination- Such concept denies rights to local women in case she marries and outsider. 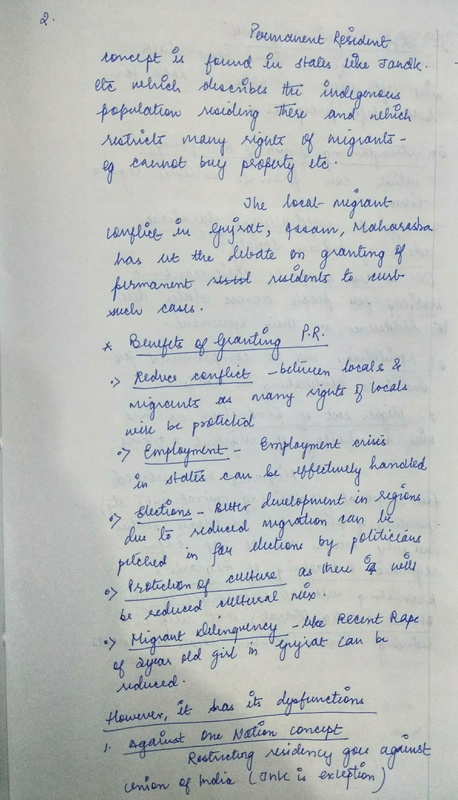 Migrants have helped in socio-economic upliftment of many regions like GIFT city, Mumbai etc. 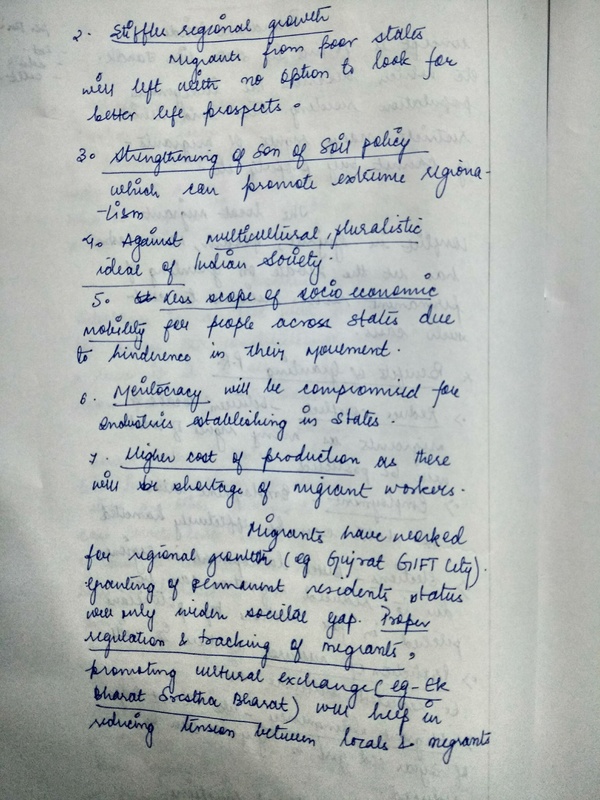 It is in the interest of India to allow free movement of people, although few safeguards can be taken so as not to devoid the local population of its rights.